Another first for Langhorne Carpet Company: The heritage Bucks County mill will offer our distinctive Alpaca Collection at 20% off, while supplies last. Alpaca is the gold standard of all-natural carpet fibers. Grown in Peru and harvested each spring, alpaca fleece has the luxurious softness of cashmere—and the durability of the finest wool. Langhorne Carpet, long accustomed to working with the best British and New Zealand wool, was the first mill in the United States to weave alpaca wool on its Jacquard Wilton looms into carpets. 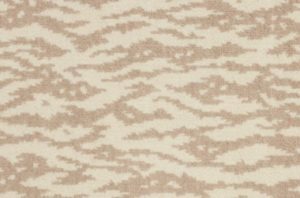 Langhorne’s Alpaca Collection includes three of our signature designs in classic beige and natural white: Mosaic/Mosaico, a geometric interpretation of tile; Moiré/Muare, waves that shimmer like silk; and Pebble/Guijarros, reminiscent of a tranquil riverbank or beach. These in-stock designs are all currently available.